My recommendation for anyone who is planning to walk the Shikoku pilgrimage, is to do it in either March, April and May, or to do it in September, October and November, when the color of the leaves is turning and the temples look like Heaven on earth. Doing it in the winter is also good, because it does not snow in most parts of Shikoku, except at the highest elevations. In those high mountain areas, icy or wet and slippery conditions might exist. We started at the beginning of May, which was quite pleasant to be walking all day outdoors. In June, the rainy season started and most days found us walking in the rain. And when it rained, it often rained all day long without a break. Now it is early July and summer is here in full force. The days are so hot and steamy that we are soaked in sweat after walking for only one hour in the sun. Walking for many hours in the heat becomes a very difficult task. The heat index today was 102 degrees and yesterday it was 105 degrees. When we visited temple 86, we heard distant thunder roaring to the sky. 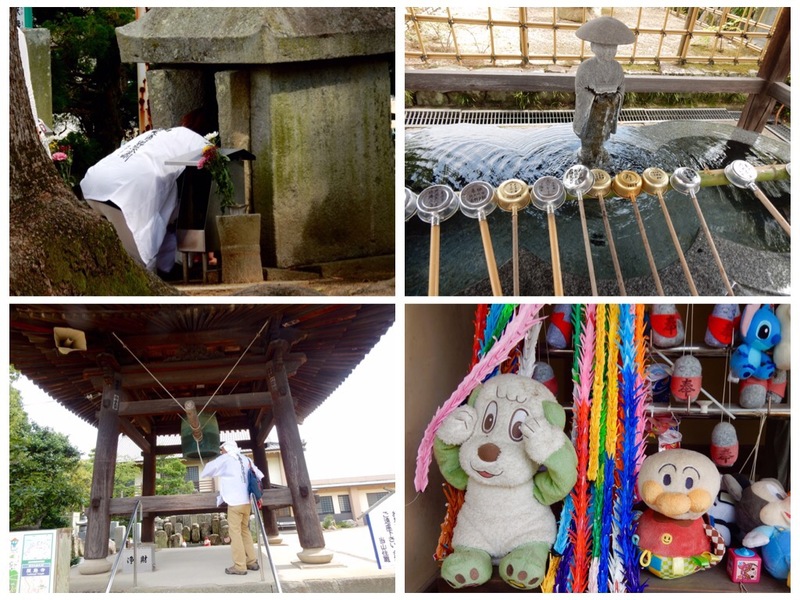 In the past two days, we visited all the temples in the Takamatsu area. At times, we walked through the urban sprawl that stretches from Takamatsu harbor all the way to the southern mountains. There were also many rice fields between the areas of urban development, and small towns that blend into one another to create the urban sprawl. We were so tired when we arrived in Takamatsu, that we spent the first day as a half a rest day. We walked to the Starbucks, got a haircut for Jules, ate lunch at a good conveyer belt sushi place, and walked through a street full of car dealerships and auto repair shops, to Temple 83. A bus full of sweaty pilgrims arrived just as we got there. Most of them wanted to know where we come from, and then they lined up to stick their heads into a small stone pagoda. It is said that a person who does a lot of evil deeds, will not be able to get his head out of the pagoda. They all got their head out with no problem. Back in the city we were too tired and too sweaty to dine out. We bought a fresh baguette, Dijon mustard, avocado, tomatoes, cucumbers, goat cheese, olives and fresh figs. In the last few days, while we walked in the mountains, the smell of fig trees in the sun, made me feel extremely homesick. I wondered to myself…. For Israel, where I grew up? The smell of fig trees is not a big part of my memory of the country…. Perhaps I remembered my time in Greece? Or a past life memory?…. Why does the smell of fig trees in the strong sun make me so homesick that I feel my heart ache?…. So many unanswered experiences and dreams have been appearing for me on this pilgrimage….. The summer nights in Takamatsu are steamy and hot. After our long day of walking, I escaped to the shower in our comfortable suite, and then made us baguette sandwiches. We had bought the imported items in a speciality store, and those simple sandwiches cost more than a meal in a nice restaurant. The next day we visited three temples, numbers 84-86. Temple 84 Yashimaji, is located on the top of Yashima mountain, overlooking the Takamatsu waterfront. There are rock sculptures of two giant badgers located close to the Hondo (main temple). Badgers are revered in the Shinto religion because they are believed to have the ability to change into humans at will. The founder of this temple was once lost in the dense fog that frequently blankets this area. An old man in a coat made of straw suddenly appeared, seeming to come out of nowhere, and led him to safety. The founder built this temple to show his gratitude to the old man (actually a metamorphosed badger) who had saved his life. Temple 85 Yakuriji, is located a bit east on the waterfront, on top of Goken mountain. There is an inter-coastal waterway between temple 84 and 85.. Both are beautiful mountain temples, but a bloody battle between two warring clans occurred here in the twelve century. It is said that the ponds and the inter-coastal waterway ran red with the blood of the dead and wounded during these fierce battles. The walk between those temples is lined with memorial stones and shrines to commemorate the warriors who died in those battles. Many of the plaques describe the actions of brave samurai warriors, who died protecting their lords or battle commanders, sacrificing their own lives by stopping an arrow intended for their masters with their own bodies. From temple 84, we walked to the cable car that took us to the top of Goken mountain, where temple 85 is located. On the way to the cable car, we stopped and had a lovely lunch at a beautiful Udon restaurant located inside a traditional Japanese house, with a beautiful garden. It is a popular and very well-known restaurant, but we were lucky to come at a good time and were seated on tatami mats in front of the garden. The delicious cold Udon noodles, served with tempura and Mackerel sushi, and of course the good air conditioning, revived us a bit. Just sitting without our shoes helped our feet to rest, and the air conditioning was such a nice break. Temple 85 felt very magical to me. The sun danced on the rocks in a way that resembled fire, and the old trees around the temple were majestic. There were also a few temple buildings with old thatched roofs and beautiful wood carvings. At Temple 86, we were invited to rest and have tea and sweets. We welcome every opportunity to have a rest and to take a break. It is an ancient temple that seems to be run and maintained by an overworked couple who have too much to do. Many of the Buddhist and Shinto temples in Japan are owned by a single family who maintain the temple and service the needs of a small community of local devotees. There may be many Buddhist temples in a single town. Often, the family sends one of its sons to a regional or national training temple to become a Buddhist priest, but in some cases they hire a priest. Maintaining an ancient temple with many old wooden buildings and an elaborate garden, is a huge task. There is constant maintenance and gardening to be done. There are also lots of expenses connected to the upkeep of these temples. That night, after we got back to our hotel, I showered and then fell asleep immediately. I slept for eleven hours straight and woke up feeling more refreshed and energetic. I sure needed the long sleep…. Tomorrow we have a long day of visiting temples 87, and our final one…. Temple 88!!!!! This temple was founded in the year 754 by the famous Chinese monk Chin’en-chen (Ganjin) who came from Yoshu in China. It was a Ritsu (Vinaya) temple until Kōbō Daishi converted it to a Shingon temple. The hondō and honzon are both of the Kamakura Period and designated as Important Cultural Properties. The Senju Kannon was carved by Kōbō Daishi. The temple is near the site of the Battle of Gempei, where the Genji and the Heike Clans fought at the end of the 12th century. It was originally founded on the northern part of the island and then moved to the southern part by Kōbō Daishi, hence the temple’s title of Nanmen-zan (The mountain that faces to the south). This temple is located on Go-ken-zan (Five sword mountain) and was founded by Kōbō Daishi in the year 827 after five swords appeared in the sky, signifying a successful completion to the gumonjihō rite. The top of the mountain has five huge rocks on the top, as the name also signifies. When on the way to China, he planted 8 baked chestnuts (Yakuri) here and on his return he found that they had grown into great trees, hence the temple’s name. The honzon is also attributed to Kōbō Daishi. As with most temples, Chōsokabe’s samurai warriors burned the temple down in the 16th century, but it was rebuilt by the Lord of Takamatsu Castle, Matsudaira. Thousands of people visit here on the 16th of every month to pray for the success of their businesses. This temple was built in the year 694 as a memorial to the wife of the Fujiwara clan leader, who was a brave diver. One of the daughters of the Fujiwara clan went to China to become a concubine of the T’ang emperor Tai-tsung. The boat carrying the jewels sank near Shido Bay (where temple 86 is located), and the three jewels were taken by a Dragon who lived under the sea at Shido Bay. The head of the Fujiwara clan agreed to marry a woman who was a local diver and not an aristocrat, if she would agree to dive to find those jewels. She gave birth to a son and promised to dive to recover the jewels, on the condition that her husband promise to make her son his sole heir. On her dive, she recovered the jewels, but the Dragon King saw her and she had to cut herself open and hide the jewels inside her body. She was dead when she reached the surface. The son, Fusasaki, became the heir of the northern branch of the Fujiwara aristocracy. The jewels now sit between the eyes of the Shakuson statue at Kōfukuji temple in Nara. The main Buddha with the Fudō and Bishamon are all National Treasures. The wooden dragons on the hondō, and the five-story pagoda are very beautiful. Thank you dear Pam for following our pilgrimage and for you kind words. I am so ready to go home, although only time will tell if I will miss it.